Ruptures are one of the most pressing issues facing America’s bridge-attached pipelines, and they’re more common than you think. Sensitive utilities such as gas and water are susceptible to rupture for myriad reasons including inclement weather, deferred maintenance, and even accidental puncture. The good news is, most bridge pipeline ruptures are totally preventable. Aptus is an industry leader in repairing bridge-attached utilities when they rupture, but we have a vested interest in preventing these kinds of issues from happening in the first place. Here are three ways we’ve proven can stop bridge piping ruptures before they start. Maintenance is the backbone of a high-functioning bridge system. Bridge experts know that maintenance isn’t a one-off activity, it’s an ongoing effort that changes in scope with the age and condition of the bridge. Thorough, regular inspections of bridge-attached pipelines can shed light on a number of potentially-risky issues. Cracks, fissures, and even detachment points can be easily remedied when caught early on. Regular maintenance performed by a licensed, experienced crew of technicians is the best way to ensure this happens. Corrosion is the enemy of bridge-attached piping. A natural byproduct of age and exposure, corrosion weakens joints, deteriorates metal piping, and hastens the need for replacement. All bridge piping should have an anti-corrosion plan in place. The plan itself will depend on a number of factors such as the piping’s outer material and the atmospheric conditions of the area. Technical solutions against corrosion can include galvanization or wrapping/painting with an anti-corrosive outer-layer. In the best-case scenario, bridge pipelines will be made of anti-corrosive materials before they’re installed. 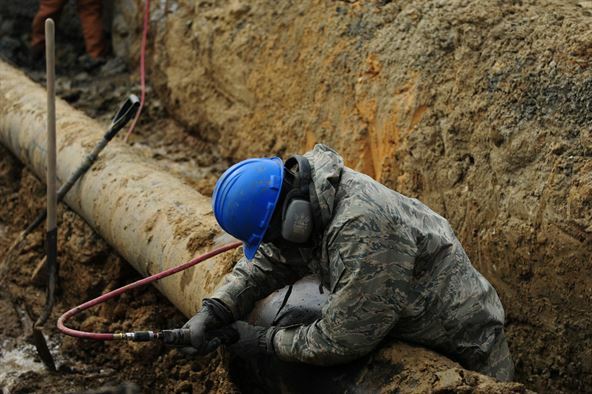 A surprising number of pipeline ruptures occur because of human error. Maintenance workers on bridges using improper tools, referring incorrect diagrams, and even “learning on the job” have been known to puncture or otherwise cause pipelines of various sizes and shapes to rupture. Prevention starts with better training. All pipelines on bridges should be mapped exhaustively so there’s never any question regarding what is located where. Maintenance teams should be alerted of any potential vulnerabilities such as previously-repaired areas or connection points. When in doubt, a bridge piping expert should be on hand to supervise any maintenance efforts that may impact the structural stability of the piping itself. Bridges are one of America’s most underappreciated infrastructure resources. They support many of the most important pipelines in the country, carrying everything from natural gas to fiber optic cabling to communities and cities in every state. Aptus is the leader in bridge-attached piping. We specialize in repair, maintenance, and installation, but our experts are always on-hand to provide advice when you need it most. Reach out to the Aptus team today to get started with a piping plan.